Speaking of the Delaware Canal it is this week's Weekend Escape. and there are portions on the PA side that are still rideable. 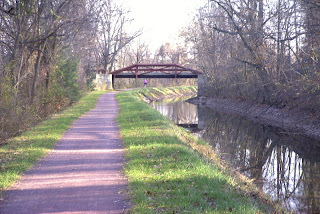 miles of the Delaware Canal from Morrisville and offer some unexpected tourists sites in Trenton and extra lodging option especially when the B&B's in Bucks County are full..
As mentioned the Trenton Marriott is a full service hotel less than a mile from the Trenton Train station in Downtown Trenton. Across the River adjacent to the Canal is the Holiday Inn Express in Morrisville. Further upstream is The Inn at Lambertville Station. Inquire about bicycles before you make your reservation. Large Groups can arrange for camping at Washington Crossing State Park at the above website. From Doylestown you can ride the scenic twelve miles from the R5 Train Station or you can connect to Trans-Bridge bus NY to Bethlehem Service which stops in New Hope, Lambertville and even Frenchtown. Trans-Bridge supposedly charges $7 for an unboxed bicycle but I have not seen that levied on anyone that I know. But be prepared to pay or rejected if the luggage bay is full.). Here is a review of a trip some of us took to the Canal via train and bus in 2004.